So many of the articles that I have read about Kenneth Jay Lane have touched upon his ardor, not to mention his flair, for entertaining. In fact, photos from one of these articles appeared on my blog a few years ago. 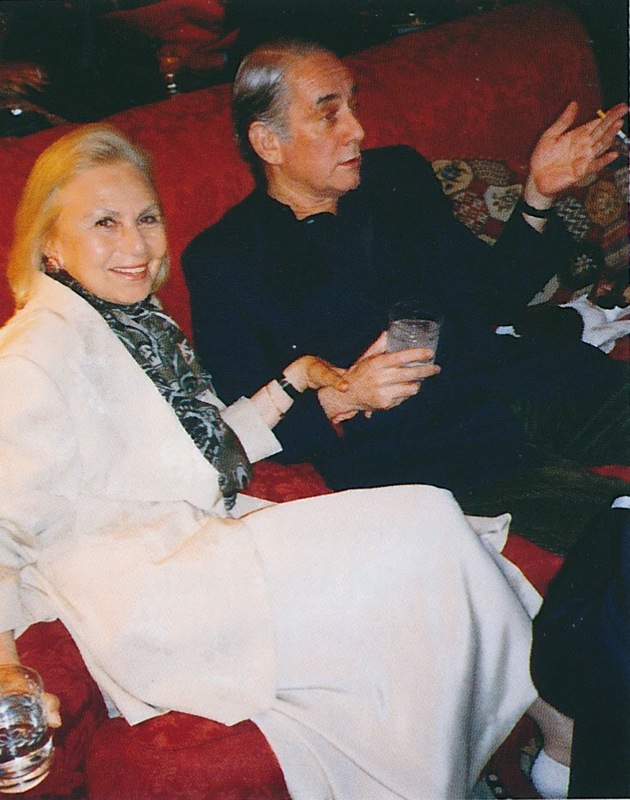 And here we go again: yet more photos of Mr. Lane's apartment with his chic dining banquette. 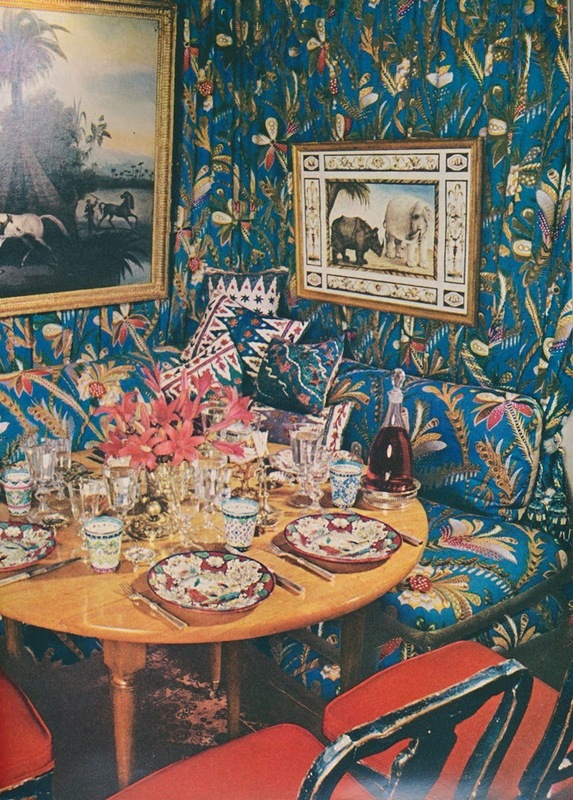 The two photos, above, were featured in House Beautiful's Home Decorating in 1973, back when Mr. Lane's dining room was swathed in a rather exotic-looking fabric. It was a space redolent of Scheherazade and One Thousand and One Nights. The photo below the banquette shot, by the way, shows how Mr. Lane liked to serve after-dinner coffee and liqueurs in his living room. 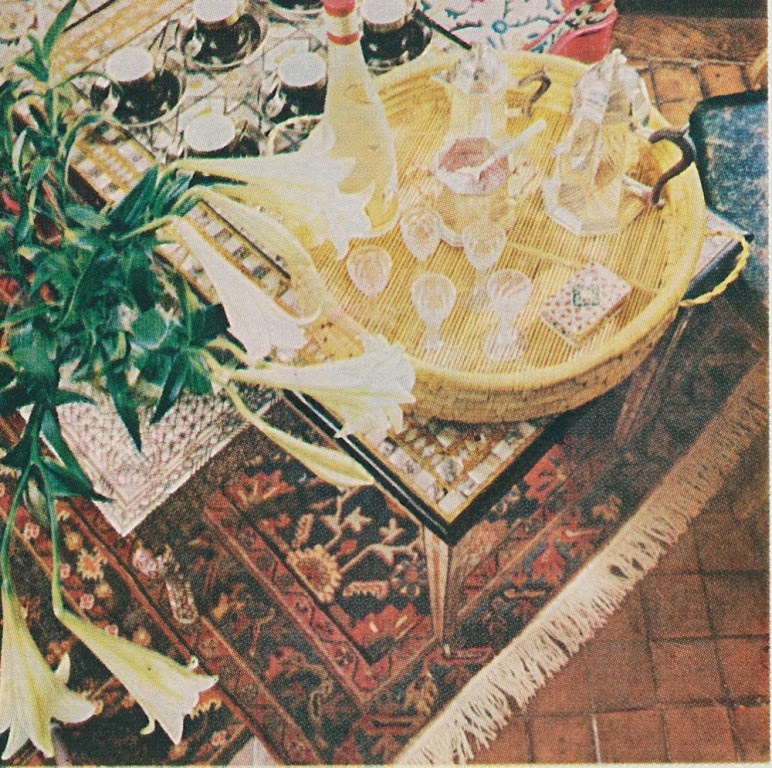 According to one article, Lane preferred to serve his guests Moroccan food, a fitting cuisine for such an exotic surrounding. However, any sumptuous dish, especially one with international flavor, would work well within these opulent confines. Can't you just see Lane's guests' tucking into his famous Caspian Potato Salad, a decadent dish in which Osetra caviar plays the starring role? Place the potatoes in a large pot with water to cover and bring to a boil. Cook for 15 to 20 minutes, until the potatoes are tender but still firm. Drain and set aside to cool. Peel the potatoes and slice them into 1/4-inch-thick slices. Place the slices in a large bowl and cover with the wine, and marinate for 30 minutes. Meanwhile, prepare the vinaigrette. Place the lemon juice in a small bowl and slowly add the olive oil in a steady stream, whisking constantly until emulsified. Season with pepper. Drain the potatoes and gently toss with the vinaigrette. Just before serving, gently fold in as much caviar as desired.